NEW YORK — Denial. Anger. Acceptance. 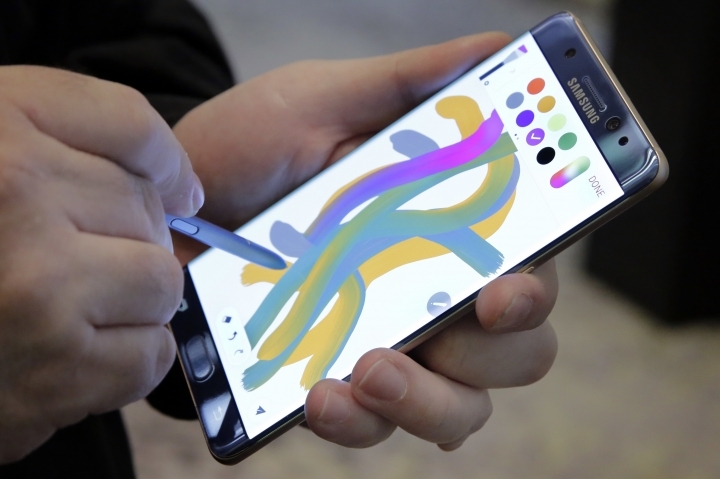 Consumers who shelled out $850 or more for the sleek Galaxy Note 7 are moving right through the stages of grief following Samsung's recall of smartphones that have been catching fire — and not in the good way. Some are still using the phone and bear no ill will toward the Korean electronics maker, which has promised replacements by next Wednesday. Others have angrily switched to Apple or other phone providers. And some have gone back to older phones or are even forgoing using a smartphone altogether. "I'm not mad, but it's a little bit aggravating to have to go through the recall," said Philip Montgomery, a retiree in Ft. Worth, Texas. He plans to get a replacement phone next week, but until then, he'll keep using his Note 7. He figures his odds of avoiding fire aren't too bad: "My phone doesn't get as warm as my wife's Galaxy 6 does." Out of 2.5 million Note 7s sold worldwide, Samsung has received 92 reports of batteries overheating in the U.S., including 26 reports of burns and 55 of property damage, according to the website of the U.S. Consumer Product Safety Commission, which issued a formal recall of the phone on Thursday. It said property damage included fires in cars and a garage. One family in St. Petersburg, Florida, said a Note 7 left charging in their Jeep had caught fire, destroying the vehicle. The consumer-safety agency said owners of the fiery phone should power it down immediately and stop using it. That isn't sitting well with everyone. "I told somebody yesterday I'm not giving up my Note 7 until they have to pry it from my cold dead hands," said Cathy Horne of Auburn, Georgia, who uses her phone for news, email and entertainment while commuting on public transit. She'll replace the phone next week, she said, but plans to take her chances until then: "I love my Note 7." Then there are the risk-averse. Daniel Marchena of Lakeland, Florida, said he powered down his phone and left it sitting on his TV stand. He feels betrayed by Samsung and has jumped ship to get an Apple iPhone, despite being a gadget enthusiast and lifelong "Android guy." "I was very excited about the Note7," he said. "The screen was amazing, the camera perfect and it was a beautifully designed phone." But he thinks Samsung downplayed the severity of the battery issue so he decided to make the switch. "My wife and two young children were at risk," he said. "Trust is something that is very hard to gain back, especially when the market is so competitive." Warner Crocker, in Chicago, returned his Note 7 last week to a T-Mobile store and got a refund. He's taking a wait-and-see approach before he shells out for another Samsung phone, or any phone for that matter. 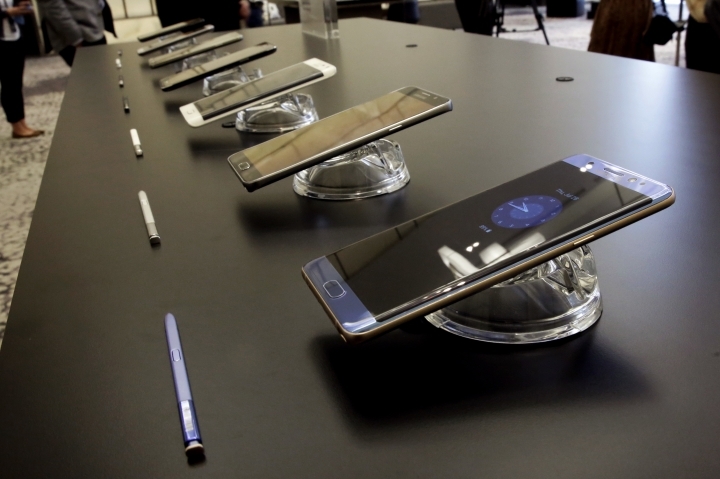 "I really liked the Note 7 — it was a beautiful smartphone, it had a lot of interesting capabilities," he said. "But I'm going to wait and see how things shake out before I go down that path again." Marcus Nelson, from Tampa, Florida, exchanged his Note 7 for a Galaxy S7 on Thursday after the CPSC issued its formal recall, even though the process of returning the phone to the Target that he bought it from was "painful." He and his wife feel locked into Samsung products because they have related accessories including a Gear watch and earphones. He plans on returning to the Note 7 — or its successor — once he's certain the battery issue is fixed. "Knowing technology, we'll have a Note 8 before they figure out the 7," he said. Brandon Bailey in San Francisco contributed to this report.